Want To Travel With Me In My Traveling Cottage? Well….drum roll please!!!!! I can now officially announce that the Shiley’s have a little traveling cottage! Yep!! You guessed it! 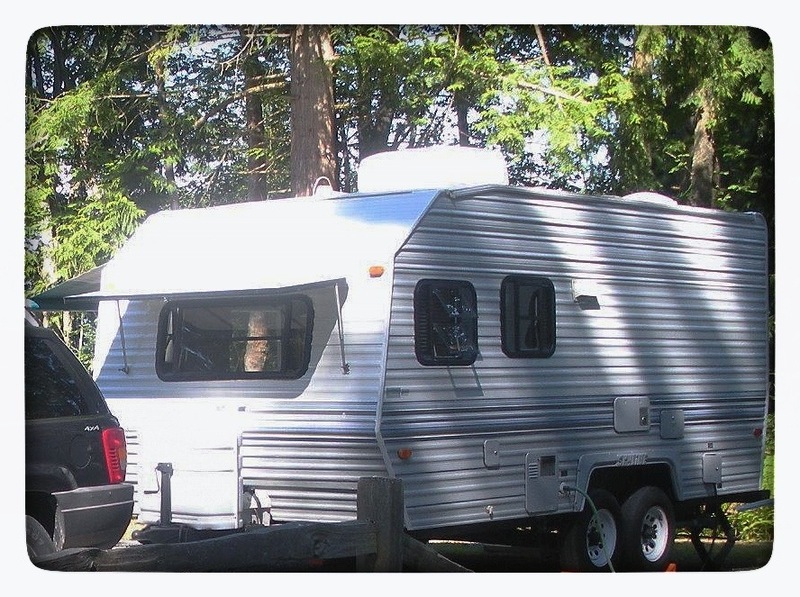 We are proud owners of a cute little camp trailer that I will lovingly refer to as our traveling cottage! My mom and dad would be so happy and proud! What’s up with getting a trailer you may ask? I grew up in one! As a child, and even into teen years, we went every where and camped in our little Canned Ham Style Trailer, as they are lovingly referred to. I loved it! We went to the lakes, the ocean, parks and various places and enjoyed the ability to travel, see things we hadn’t seen before and bring our home with us. Our first trailer was VERY small and not self-contained, but we didn’t mind running to the camp site bathrooms. I always slept in the hammock above the couch (that folded down into a bed) and would wake up to the smell of coffee every morning as dad, or sometimes mom, would be making coffee. Not much chance of sleeping in when you are right on top of the kitchen. But I wouldn’t trade those days for anything! We got up and going and were out all day making our own fun and exploring the area where we stayed. We ran the beaches, dug for clams, raked smelt and fried them up that night. We had campfires and roasted hot dogs. We would have s’mores for dessert! Ah… the life! From the open windows at night, you could smell the outdoors, listen to the sound of the running river or the waves of the ocean, and of course, I often was itching from mosquitoes! I remember so well! Many times, I brought a friend along with us on a camping trip! But the thing that I forgot to do is tell my folks how much fun those times were to me. They sacrificed a lot to have that fun. On a tight budget, they bought their first trailer. It was gray and white on the outside. I loved that thing! When I had friends spend the night, we would sleep out in the trailer to have our own over night experience! But one day, when we came home from school, as I have shared in a previous post, my mom had apparently gotten bored, and she had painted the inside of the trailer lime green and tangerine orange!!! Oh my! Dad couldn’t believe it when he came home to that! She on the other hand? She was quite pleased with herself! But those sacrifices to enjoy themselves and relax, were also given as a way to give us pleasure. We had no problem helping load things up when mom or dad would tell us we were going camping! Boom!… Done! So, I have always wanted to have that same opportunity for myself and the kids. That hasn’t been something that I was able to do for them. We were able to do some camping, but nothing like when I was a child. I am happy to see them doing some of it themselves now, however. But as my sweetheart and I talked, we really wanted to make a way to have a “home away from home” to enjoy the outdoors together, a camp fire, a little outdoor cooking and the view of the water when it was available (my request). We have a Thousand Trails membership that belonged to my folks and I received that from them. So I feel like their legacy lives on in my sweetheart and I and our little traveling cottage. We can now build those memories and share them with friends and family. We can give those to Ethan, our grandson and make my folks’ sacrifice a legacy that we pass on. It took us longer to achieve it, but it’s all in God’s timing. My advice and thoughts? Don’t wait until you can’t tell your parents anymore how much those kind of memories are cherished by you. I would love to tell my folks, but I can’t. If you have yours around, be sure to share how much you loved the fun times together and share a thought or two with them about what it meant to you. They will love to hear it! It helps them know that how they lived out their life meant something to you, and that you cherish those memories. It’s the heart of your family. Previous postWhat Level Is Your Hope Quotient At?